This fresh, simple but unique approach is written by a seasoned sales person with decades of successful sales experience. "I have sold everything from power tools to fund management. From the boardrooms of the super wealthy, to buying and selling companies. I have trained sales people, directors and business consultants. I learnt that sales is not a process or a pitch and you really can’t do it in an elevator!" Kiki Theo is a wealth catalyst. An innovative entrepreneur, she combines an extensive business background including over a decade in her own fund management company, with her lifelong study and practice of metaphysics, mindfulness, and Jungian psychology. A wealth expansion expert, Kiki is the author of Money Alchemy and numerous holistic wealth training books, the creator of Money Energetics® processing and the founder of Wealth Works Institute. Selling is simple. You need to find out what the client wants, and then give it to them. This book shows you how. 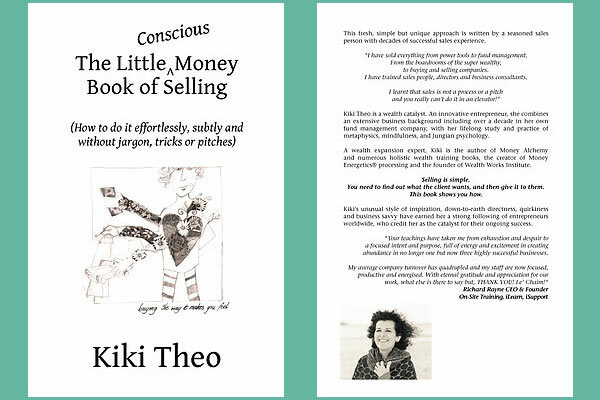 Kiki’s unusual style of inspiration, down-to-earth directness, quirkiness and business savvy have earned her a strong following of entrepreneurs worldwide, who credit her as the catalyst for their ongoing success. "Your teachings have taken me from exhaustion and despair to a focused intent and purpose, full of energy and excitement in creating abundance in no longer one but now three highly successful businesses. My average company turnover has quadrupled and my staff are now focused, productive and energised. With eternal gratitude and appreciation for our work, what else is there to say but, THANK YOU! Le’ Chaim!"